The joy of insects – Aaron Pomerantz joins Real Scientists! Our curator this week is entomologist and Amazonian adventurer Aaron Pomerantz. Despite patchy Peruvian internets, Aaron happily obliged to complete our compulsory entrance examination prior to beginning his stint on @RealScientists. I was drawn to the outdoors and the natural world at a very young age. My dad has a background in biology and my mom is an avid gardener, which attracted native reptiles, birds, insects, and other critters to our home. I have a distinct memory of picking up a pill bug out of the yard and running into the house to research it. The young second-grade me memorized its Latin name, Armadillidium volgare, and the rest is history; I’ve been involved in the scientific study of insects and other arthropods ever since. I pursued a degree in entomology at the University of California Riverside and had a great experience with the professors and the field. I then went on to complete a Master of Science degree in entomology and molecular biology from the University of Florida. As I was wrapping up my M.Sc. degree, I was invited to join another graduate student colleague for a research expedition in the Peruvian Amazon. While on that trip, I was offered a position to work with the Tambopata Research Center as a science communicator. What keeps me here is the thrill of learning something new every day and the adventure of not knowing what exactly comes next. 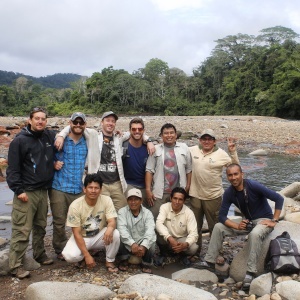 I organize expeditions to the Peruvian Amazon with teams of biologists, naturalists, and photographers. Every trip has a scientific research component and our objectives also include surveying the unexplored rainforest and documenting interesting, rare, and potentially undiscovered species. My overarching goal involves utilized social media to interact with online communities where we can share the process of scientific discovery and answer questions about nature and biodiversity, all while presenting science in a more user friendly format! I believe that scientists can and should utilize all available resources to communicate what they are doing and why it is important. It’s more critical than ever to convince policymakers and the public that scientific innovation must be nurtured to help tackle the biggest problems that humanity faces now and in the future. Like many graduate students, I became unsatisfied with the isolation of research and lack of involvement with communicating to a broader audience. So the work I’m doing in science communication will hopefully help to bridge gaps that exist between scientific researchers and the public. I contribute to a Facebook page ‘Relax. I’m and Entomologist’. The page was started by an entomology graduate student, Jake Bova, and has grown from just a few followers to over 40,000. I also run a blog called ‘The Next Gen Scientist’. I love pretty much any outdoor activity and enjoy scuba diving, tennis, and hiking. I’m also trying to teach myself more about photography and videography. My ideal day off would probably land me on a beach somewhere, soaking up the sun, swimming, and grilling up food with good friends. Please give Aaron the most hearty of welcomes to Real Scientists! Previous story A DisCERNing Scientist; Clara Nellist Joins RealScientists!